Jonathan Hallyburton – Christian piano player, will be sharing the Gospel in word and song on Sunday 30th December 10.30 a.m. – 12.00 noon. 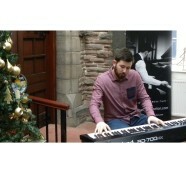 Jonathan was in Cross Street Church this week recording some videos of instrumental carols. We look forward to him visiting us at Cross Street to share “the black and white truth”.